Over the last two decades, state governments in India have adopted a range of initiatives to bolster their economic potential and attract foreign investment. In the 1990s, a number of states, beginning with Andhra Pradesh, sent high-level delegations, with then (and current) Chief Minister Chandrababu Naidu leading from the front. Even Prime Minister Narendra Modi, as chief minister of Gujarat, led delegations to countries such as China, Japan and Singapore. More recently, states have been to hold investor summits, drawing not only potential investors – foreign and domestic – but also foreign diplomats and influential members of the Indian diaspora. 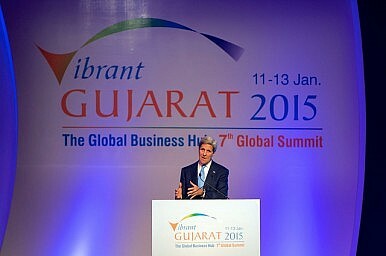 Gujarat kicked off this trend with the first of the bi-annual Vibrant Gujarat Summits in 2003, more than a decade ago. Other states have since followed suit, aiming to showcase their economic achievements as well as their efforts to cut red tape and become more investor friendly. A number of high-profile summits were held recently. and seeking foreign investment. In October, Madhya Pradesh organized its investor summit, which was opened by none other than the Indian prime minister himself. Then last week there was the Bengal Global Business Summit organized by West Bengal, and this week the Vibrant Gujarat Summit in Gandhinagar. The West Bengal Summit was dubbed a success by Chief Minister Mamata Banerjee, who spoke about the initiatives her government had taken to reduce the massive debt burden, as well as the potential of the state. The state government claimed that billion of dollars worth of memorandums of understanding had been signed. The Vibrant Gujarat Summit also drew considerable attention, with Modi present at this event as well. Eight countries, including the U.S., U.K., Canada, Netherlands, South Africa, Japan, Singapore and Australia signed up as partners. In addition to top CEOs from India and abroad, the list of participants this year included U.S. Secretary of State John Kerry, Bhutanese Prime Minister Tshering Tobgay, UN President Ban Ki Moon, and World Bank President, Jim Yong Kim. Modi spoke about the steps taken by the central government to ease business, while also emphasizing the need for cooperative and competitive federalism among the state governments and center. There is nothing particularly wrong with the intent of these investors summits, which is to enhance the image of a state, and compete for investment. This is a healthy trend as economic growth and prosperity will not just benefit one state, but the country as a whole, and will push other states to reach out to investors in India and abroad. Yet there are a number of steps – political and logistical – that could be taken in order to make investor summits more effective. Modi has repeatedly spoken about cooperative federalism and the need to grant a more meaningful role to states in foreign policy. Given that, it would make sense for states and the central government to work closer on these summits. The interest of the center in summits being organized by state governments, should not be influenced political considerations. The participation of Finance Minister Arun Jaitley in the West Bengal Summit was an encouraging sign in this regard. The prime minister’s active participation in an investor summit organized by a Northeastern state, one not led by the BJP, would send the right signals. This is important because otherwise coverage of summits is extremely skewed, and influenced not just by the economic prowess of a state, but also by political considerations. If a state is led by a high profile chief minister, the media tends to devote more time and space to the summit. The Vibrant Gujarat Summit of course received coverage because Modi was in attendance. Second, states should seek to learn from each other’s experiences. While it is true that different states have different strengths, they can learn from each other’s successes and failures with regard to the organization of these summits, and what makes some more effective than others. Third, Modi has spoken about showcasing India beyond New Delhi. Similarly, it is important to showcase towns beyond the capitals or major cities of states, as this will boost awareness about lesser known towns within states that have potential, improving infrastructure and making growth more equitable. All states hold these summits in either the capital city or prominent cities, Gujarat in Gandhinagar, MP in Indore (the business hub of the state), Punjab in Mohali (a suburb of Chandigarh, the capital of Punjab and Haryana), and West Bengal in Calcutta. Of course, there are a number of reasons for this, including the natural desire to showcase the best of a particular state and the need to maximize convenience for visitors. Still, organizers should explore the possibility of holding these summits in towns other than the capital or commercial hub. State governments also need to reach out to small and midsize investors, in India and overseas, who are overshadowed by the big names at these summits. Fourth, while there is no harm in states competing with each other economically, it is important that such summits do not lose sight of their original objective and end up in displays of one-upmanship. It is very common for states to take subtle jibes at each other; this helps no-one’s cause and defeats the overall purpose of summits, which is healthy competition, not political point scoring. All stakeholders, including governments (state and central), businesses, and chambers of commerce have a responsibility to make investor summits more effective and more inclusive. Tridivesh Singh Maini is a Senior Research Associate with The Jindal School of International Affairs, OP Jindal Global University, Sonepat. He was previously a Public Policy Scholar with The Hindu Centre for Politics and Public Policy.